Acura, Subaru & Honda (1990-2012) 5-Pin Multi Use Silver Relay RC5102 RC-5102 12V Mitsuba Japan. Made inJapan by Mitsuba. Genuine5 Pin Silver/ Grey Relay /Multi-Use Relay. Colour:Silver/ Grey. Honda Almost All Models (1990 - 2012). Honda /02-12 Diesel 9-Pin Glow Plugs (Replacement) Relay Bosch 0281003030 4-Zyl. Genuine9 PinBlack Relay For Diesel CarsGlow Plugs Relay. Honda Civic MK VIII [2005-2016] Hatchback. Honda Civic MK VII [2000-2005] Hatchback. Honda CR-V MK III [2006-2016] SUV. Honda CR-V MK II [2001-2006] SUV. 4.5 out of 5 stars - Honda /02-12 Diesel 9-Pin Glow Plugs (Replacement) Relay Bosch 0281003030 4-Zyl. 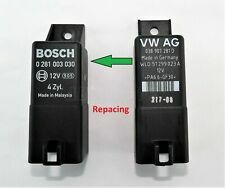 2 product ratings2 product ratings - Honda /02-12 Diesel 9-Pin Glow Plugs (Replacement) Relay Bosch 0281003030 4-Zyl. New listing476- Honda Civic Accord Diesel 9-Pin Glow Plugs Relay Bosch 0281003030 4-Zyl. 4.5 out of 5 stars - 476- Honda Civic Accord Diesel 9-Pin Glow Plugs Relay Bosch 0281003030 4-Zyl. 2 product ratings2 product ratings - 476- Honda Civic Accord Diesel 9-Pin Glow Plugs Relay Bosch 0281003030 4-Zyl. Pictures are taken for the actual item. Condition:USED(VERY GOOD CONDITION). Other Part Number: 1567002680. Part Number: 156700-2680. Honda All Models (1990 - 2012). GenuineHonda Part. Fits both LHD & RHD cars. Good Working Order. Made inJapan by Ormon. Acura, Subaru & Honda (1990-2012) 5-Pin Multi Use Silver Relay RC5102 RC-5102 12V Mitsuba Japan. Made inJapan by Mitsuba. Genuine5 Pin Silver/ Grey Relay /Multi-Use Relay. Subaru Almost All Models (1990 - 2012). 4 PIN RELAY. GOOD WORKING ORDER. 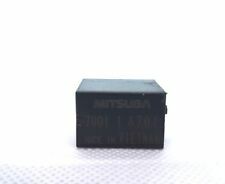 Genuine Honda4 Pin Black Relay (Multi-Purpose Relay). Honda All Models (1990 - 2012). Fits both LHD & RHD cars. Good Working Order. Made ByOmron in USA. Genuine 4 Pin Green Relay /Multi-Use Relay. Condition:Used and Good Working Order. GenuineHonda Part. Fits both LHD & RHD cars. Good Working Order. GENUINE HONDA MITSUBA AIR CONDITIONING RELAY FITS THE FOLLOWING VEHICLES :-. We are an established Honda main dealer and can provide genuine parts & accessories for all the Honda range. All our parts are ordered directly from Honda UK and are 100% Genuine. Made inJapan by Omron. Genuine3 Pin Black Relay/Flasher Relay. GenuineHonda Part. Other Part Number:L11067730 and CB1aH-R-12V. Made inJapan by NAiS. Genuine4-Blade Black Relay /Headlamp Relay. Mazda All Models (2000 - 2015). Fits both LHD & RHD cars. Good Working Order. HONDA Flasher Relay. As with all genuine Honda parts expect a perfect fit and performance. Part number: 38300-S5T-004. ManufacturerGenuine Honda. This does not affect your statutory rights. 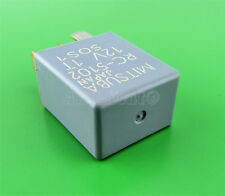 Genuine 4 Pin Black-Grey Relay/Multi-Use Relay. Made inJapan by Denso. Honda All Models (2003 - 2012). Fits both LHD & RHD cars. Good Working Order. Condition:Used and Good Working Order. Genuine 4 Pin Black-Grey Relay /Multi-Use Relay. 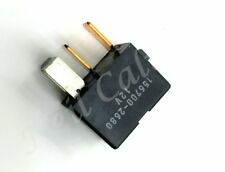 Genuine Honda 4-Pin Black-Grey Relay. Made in Japan by Denso. Genuine Honda Part. Honda All Models (2003 - 2017). Pictures taken from actual item. Good Working Order. 476- Honda Civic Accord Diesel 9-Pin Glow Plugs Relay Bosch 0281003030 4-Zyl. GOOD CONDITION SOLD AS PICTURED. OTHERWISE GOOD CONDITION. PRE-USED ITEM IN GOOD WORKING ORDER. so you can make a claim. Mazda 4-Blade Black Headlight Relay L110 67 730 NAiS ACB83221 M01 CB1aH R 12V Condition is shown on the high quality photos .All used parts has been tested and is functional can have marks wear and tear.I recommend installation in specialist garage.I not take responsibility for any damage in installation.Returns is not accepted.If you have any questions please feel free to contact. Buying this item you accepted this terms and condition. 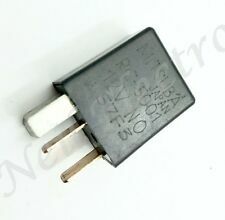 Honda Acura (2000- 2010) 3-Pin Flasher Turn Signal Relay Mitsuba FR-3321 38300-S5T-003. Mitsuba Part Number:FR-3321. Genuine3 Pin Black or White Relay/Flasher Relay. GenuineHonda Part. 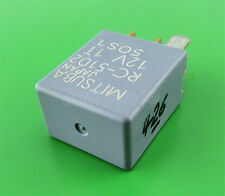 For Sale:-Fog Light Relay with Part Number:- 39870SN7G011M1 &YMC104430. Fits:- Honda Civic models from:- 1996 to 2001. Dedicated Support. You won't find cheaper prices anywhere! We're here to help whenever you need us. All Honda Civic and CRX from 1988-1991 with. 1.6 litre engine - VTEC, VT and SiR models. 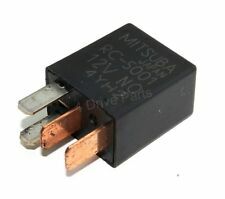 GENUINE HONDA (MITSUBA) MAIN RELAY. UK's NO.1 for Japanese Tuning Parts. This is 38310-SK4-S010 M1. From a UK Right hand drive car. 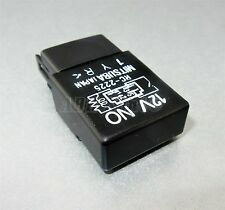 B110 Mazda 2 3 6 5 RX7 Premacy 4-PIN Black Relay B110 DC12V N.O Imasen 9K01 Japan. Made inJapan by Imasen. Genuine 4 Pin Black Relay /Multi-Use Relay. Mazda All Models (1990 - 2015). Good Working Order. Vauxhall Monterey (1984 - 1998). Vauxhall Frontera (1984 - 1998). Genuine5 Pin Blue Relay / Multi-Use Relay. Isuzu Trooper (1984 - 1998). Fits both LHD & RHD cars. Good Working Order. Made inJapan. Vauxhall Monterey (1984 - 1998). Vauxhall Frontera (1984 - 1998). Genuine6 Pin Brown Relay / Multi-Use Relay. Isuzu Trooper (1984 - 1998). GenuineIsuzu Part. Fits both LHD & RHD cars. Good Working Order. LEFT OVER FROM MY CAR THAT I SCRAPPED 10 YEARS AGO. Genuine Honda Civic CR-V Diesel 9-Pin Glow Plugs Relay Bosch 0281003030 4-Zyl. Genuine 9- PinBlack Relay For Diesel CarsGlow Plugs Relay. Honda Civic MK VIII (2005-2016). Honda Civic MK VII (2000-2005). 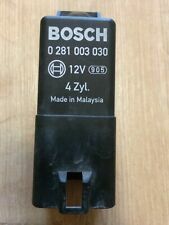 Made By Bosch in Malaysia. Genuine Honda Part. Honda CR-V MK III (2006-2016). 4.5 out of 5 stars - Genuine Honda Civic CR-V Diesel 9-Pin Glow Plugs Relay Bosch 0281003030 4-Zyl. 2 product ratings2 product ratings - Genuine Honda Civic CR-V Diesel 9-Pin Glow Plugs Relay Bosch 0281003030 4-Zyl. Made inJapan by Mitsuba. 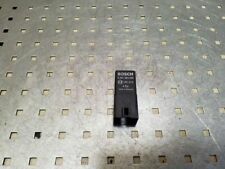 Genuine Honda4 Pin Brown Relay / Multi Use Relay. Honda All Models (2003 - 2012). GenuineHonda Part. Fits both LHD & RHD cars. Good Working Order. GENUINE HONDA RELAY. 4 PIN RELAY. Genuine6 Pin Beige Flasher Relay/Turn Signal Relay. Denso Part Number:066500-6000. Made inJapan by Denso. Other Part Number:FM257X. GenuineHonda Part. Tested and in working order. Scilly Isles. Channel Islands. Isle of Wight. Isle of Man. The Scottish Islands. The Scottish Highland. Northern Island. HONDA CIVIC MK8 (2005-2012). THIS PART IS REMOVED FROM A RIGHT HAND DRIVE VEHICLE. ANY COMPATIBILITY GIVEN SHOULD BE USED AS A VERY GOOD GUIDE 'ONLY.'. We will do our utmost to avoid this from happening. GENUINE HONDA INDICATOR AND HAZARD LIGHT RELAY. HONDA CIVIC 2001-2006 (ALL MODELS). MAY ALSO FIT OTHER HONDA APPLICATIONS BETWEEN 2001-2006. HONDA OEM PART NUMBERS UK's NO.1 for Japanese Tuning Parts. The part number is 0332017315. From a UK Right hand drive Car. HONDA CIVIC ELECTRIC WINDOW CONTROL RELAY, REMOVED FROM A 2001 REG VEHICLE, IN GOOD WORKING ORDER. HONDA PRELUDE 1984-2001. GENUINE HONDA POWER RELAY. HONDA LEGEND 1986-1990. We are an established Honda main dealer and can provide parts & accessories for all the Honda range. All our parts are ordered directly from Honda UK and are 100% Genuine. From a UK Right hand drive Car.